I can feel it …. 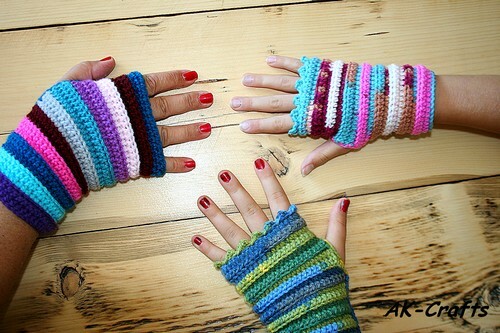 fall is just around the corner and this year I will make my own wrist warmers. I used my left over Schachenmayr Bravo yarn for mine and Schachenmayr Bravo Color yarn for my kids. You only have to crochet rectangles and then fold it in half. Now you have to stitch or even crochet it together. Oh, almost forgot …. leave a little hole for your thumb open. And that is all you have to do. 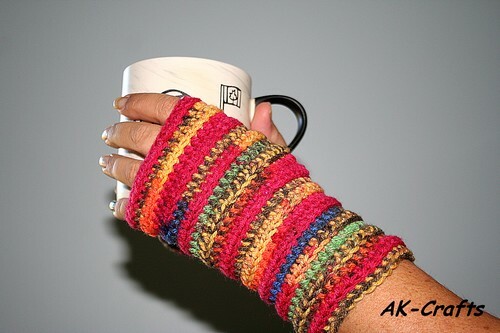 If you want you can give your thumb-opening a little edging with single crochet like I did. 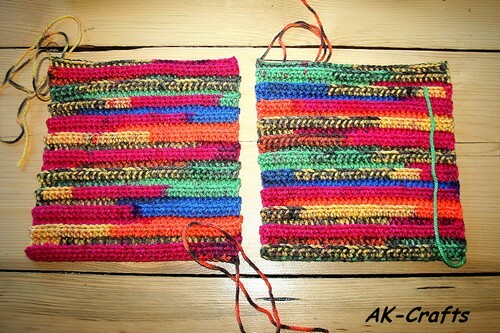 And maybe a border with picots like I did by my kids warmers. But you don’t have to. You can also leave it all plain. They always look pretty. I used Schachenmayr Bravo yarn with a 3.5 mm hook. 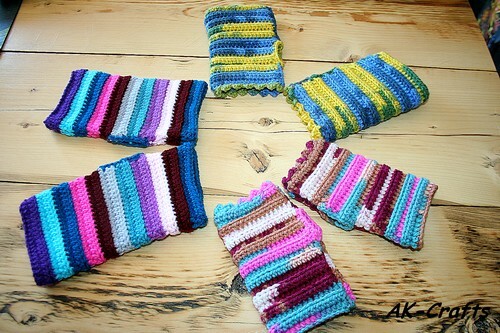 I crochet our wrist warmers in half double crochet and only in back loops, that gives it a little bit more texture. You can also crochet them in single crochet, half double crochet, double crochet or any stitch you like. This stitch creates a extra texture to your work. You will have a distinct ridge on the side facing you. You only have to insert your hook through the back loop only of each stitch (rather than under both loops of your stitch) and complete your stitch as usual. You can make with this stitch a beautiful edging. You only have to chain 3 and work one single crochet in your first chain. Then skip one stitch and work one single crochet in the next stitch. Repeat and that is all you have to do. after you make the chain which stitch do you make the first stitch into when you are doing it in HDC or do you add 2 chains on and stitch into the 35th stitch (or 3rd chain from hook)? Thanks so much. I have made many knitted, but this will be my first pair in crochet. Can’t wait to get started. Thanks again. Thanks for the pattern. Still a little winter left so I better get busy and make these. The stripes are so cute. Thanks again. I learned to crochet 70 years ago but I really didn’t do it very often. The last year or so I started again and I do some very easy things. I am very eager to do these. Just my speed. Thank you! It’s me again. I have a question. When I crochet a square it never comes out straight. My edges are wavey and I know I am supposed to start each row with an added stitch ( I think). That’s what my sister said but my friends say you do not add you just finish a row and start the next one. Do you know what I’m talking about? What am I doing wrong. Can you tell me the dimensions of your rectangles? I love this pattern, so easy and cute! One question: how do you leave a hole for the thumb? I love this pattern!! It so much easier than some of the other one online. One question though…….what is the rule of thumb for where you place a thumb hole? Is it in so many inches from the top? Thank you so very much!! I’m confused about the thumb hole. Can you give a bit more detail. Also how many rows do you do? Thank you for this pattern. Simple and beautiful! Andrea thank you so much for sharing this. 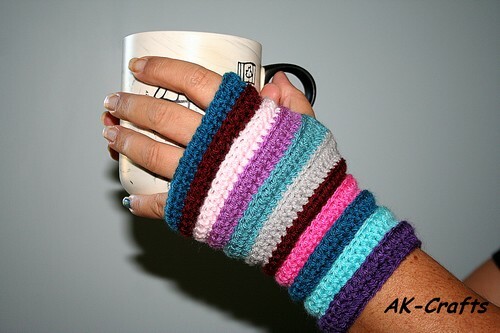 Have been looking for pattern for fingerless gloves to wear plus a pattern that I can play with wanting to make more delicate (for show) as well. 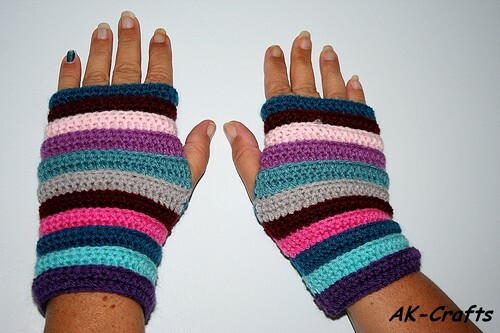 With your pattern I can both make glove to wear now and pattern to play with for different looks. I use for myself, give to family & friend if they see and want or get donated in my local area. Your pattern has answered so many questions I’ve had. Thank you again. I am so glad that you like my way 🙂 but there are always many ways to get to the goal.